Portable mattresses can be great for travelers or people who just moved into an apartment and need a little time before making larger purchases. The only issue is figuring out what portable mattress to get since there are many choices. 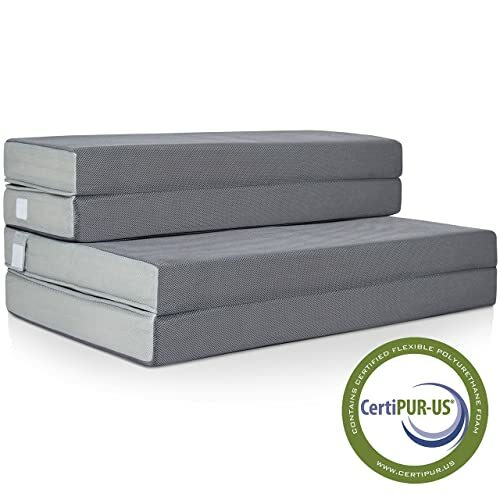 The Best Choice Products 4″ folding portable mattress is a very popular option that deserves your consideration. The mattress comes in three sizes: twin, full, and queen. The following is a simple and direct review of all three mattress sizes to help you figure out if this is the right choice for you. 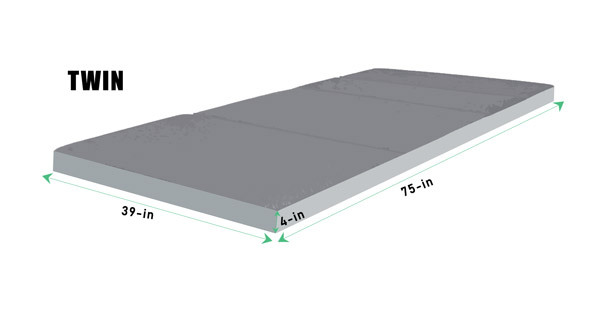 The 4″ folding twin mattress comes with a number of features that help it stand out from the crowd. Of course, its size makes it useful since it can be used as a single guest mattress, or it can simply replace a floor sofa in a small area since it is small enough to pass for a sofa. Another feature that impresses some is the material used to make this mattress. For one, it is made from high-density foam, which allows the bed to maintain its shape. The foam is quite firm yet it is still lightweight to ensure reasonable portability. Those who are worried about cleanliness should know that it comes with a removable polyurethane cover. This material is perfect for washing, no matter where you are since it also dries relatively quickly, even if you have to use the mattress later on that day. The only thing you have to remember is that the cover only needs mild soap, and be sure that the dryer is set to low heat. The folding design is ideal as you can fold the bed three times, which makes it a lot easier to carry around. It also comes with two durable handles. Of course, this mattress as well as the other sizes are CertiPUR-US certified just in case you were wondering. Let the mattress air out in a well-ventilated area for a few hours. Allow the mattress to stay open for 72 hours so that it expands. The Bett Choice 4″ portable full mattress has many of the same specs mentioned in the section above, except its size. It is a natural full mattress size, yet the design allows you to fold it three times. Again the cover is removable and machine-safe though it probably can be washed by hand if you need that. A full mattress can accommodate up to three people though it is best shared with two. You are going to need to follow some of the aforementioned directions when you open the mattress for the first time like letting it sit out for at least 72 hours so that it fully expands. Remember that the mattress will not be able to compress back to its original box-size. This is the reason you will not be able to pack it back inside but its tri-fold feature should make up for that. Queen is the largest size Best Choice Products 4″ portable mattress that can comfortably fit three people though one more is possible. Again, this is a firm mattress due to its high-density foam. It’s washable cover makes it easy to use for extended periods of times, and its lightweight material makes it easy to travel with. The number of people enjoying the great outdoors is decreasing, and one reason this disconnection is happening is because most people are stuck at home on smart devices or surfing online. Giving yourself a mattress this size gives you an opportunity to camp with the entire family without worrying about being uncomfortable. The foam material is soft and ensures that you have the fullest support. The material is long-lasting, so you should be able to enjoy this comfort, even after some time of usage. Keep in mind that making sure you are comfortable also ensures that you have a good night sleep when you are away from home, which is great for your health. The heavy-duty high-density foam also helps retain heat, making you feel warmer at night if needed. This is good news for those who are going to be camping out in colder temperatures. Of course, if you need to cool down the mattress, you can do so by lifting the mattress using wood or another foundation that allows circulation. The sizes are varied though the brand is still missing a few additional sizes that might be helpful like the king size. A positive thing that should be noted is that this product comes as a tri-fold, allowing much more portability than other similar beds. They do not require any assembly either. The mattress comes in a simple gray color, which is great because it will not get dirty quickly and still allows maximum visibility just in case you are camping with it because the possibility of bugs is always lingering. Make sure that you add a few extras to increase your comfort, such as a memory foam pillow and maybe even a mattress topper if you prefer something a bit softer because these mattresses are firm. The firmness can be seen as a drawback for some, but this mattress should be comfortable and it offers the most support, especially for those who have back problems.